UCF celebrated Charles Millican Legacy Society members during opening night of UCF Celebrates the Arts on April 6. More than 80 donors who have included the university in their estate plans were honored at the Dr. Phillips Center for the Performing Arts and thanked for their commitment by Jeff Moore, dean of the College of Arts and Humanities, and others. Moore, who helped launch the UCF Celebrates the Arts festival four years ago, is also a member of the Millican Society. He and his wife established the Jeff and Mindy Moore Endowed Music Scholarship at UCF. “My legacy gift is scholarship, in an area about which I am extremely passionate – music, and specifically percussion – at a place in which I believe: UCF,” he said. 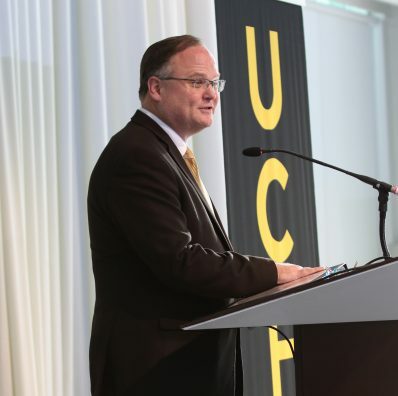 The Charles Millican Legacy Society is named in honor of UCF’s founding president. Two years ago, which would have been Millican’s 100th birthday year, a goal was set to add 100 new members by the end of the IGNITE fundraising campaign. Planned gifts are an important part of IGNITE, a multi-year fundraising effort to raise $500 million for the university by mid-2019. They currently make up $62 million of the campaign’s $365 million attainment. If you’d like to speak to someone about making a planned gift, please contact Kathleen Hagerty, at Kathleen.Hagerty@ucf.edu or call 407.882.1237.